Spring is here and in NW PA that means that we often have some of the most vibrant sunsets of the year. Here’s a sunset skinner blend recipe that mimics the color palette of the setting sun; I’ve aptly named it “Sunset” … imagine that. Color recipe uses Premo! polymer clay by Polyform. Make the sections of your skinner blend as show in the photo at right. There are “unnecessary” colors in this palette, however, because I wanted strong oranges and burgundy, this is the palette I have chosen. *The effect shown is after approximately 35 passes through my pasta machine. Add more white to the entire blend to soften the sunset effect. Darken the sunset by adding a strip of black to the blend. 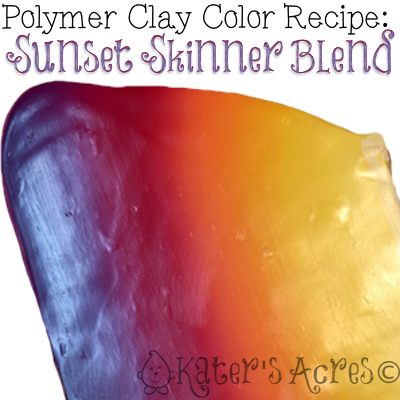 Make the sunset translucent by adding translucent clay to the entire blend. I struggle to make blends in general and need some direction on this one. Do you fold the clay before rolling it through, or do you just roll it through as is? If you do fold it, can you explain simply (I have a head injury and need simple directions) how to fold it properly? Hi Eileen, fold the blend in half with the edges lining up on the same color … in this case, white on white and purple on purple. Continue folding this way as you roll it. Always white edge to white edge and purple edge to purple edge. You’ll be good to go! About adding translucent polymer clay: would you cover the whole piece with a thin layer of translucent clay to do that. This blend is so pretty! Apply a strip of translucent clay covering approximate 1/4 to 1/6 of your blend, fold in half and continue to roll through the pasta machine (the same as you did when making your skinner blend) until all the colors are blended and the new translucent blend is completely combined. ENJOY!